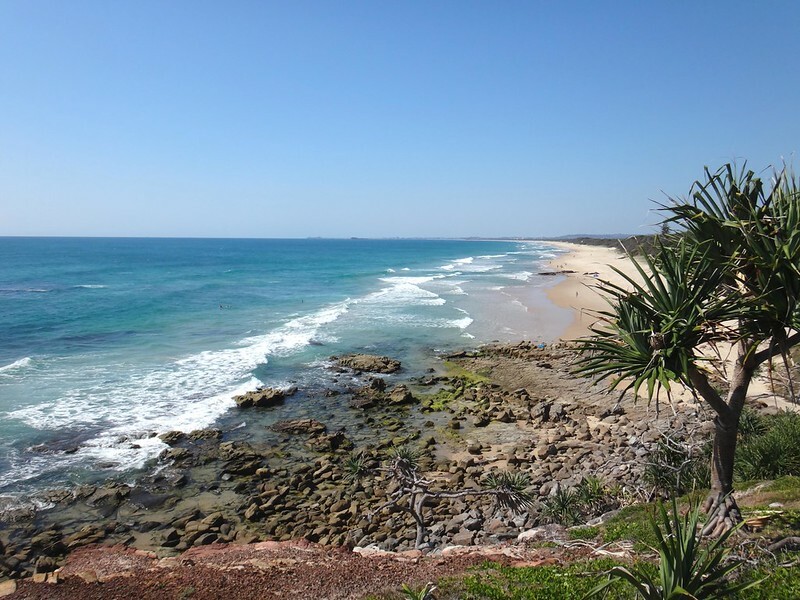 Two hundred years ago, a couple of hapless convicts trudged northwards along the beaches of Queensland’s Sunshine Coast in the vain hope that they might eventually reach Sydney. 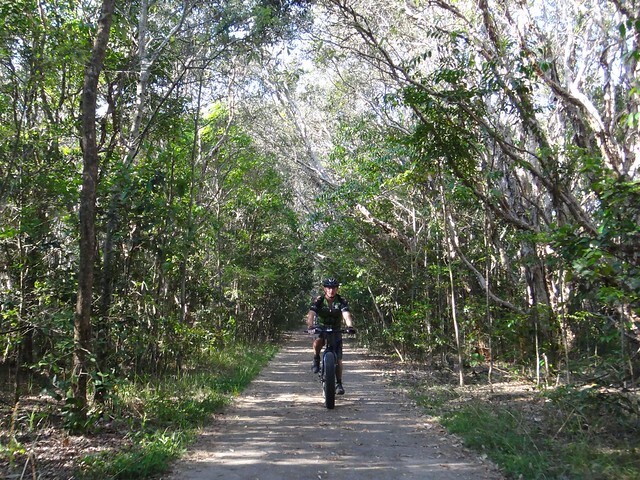 Although they were headed in the wrong direction, Darb and I retraced some of their footsteps on our bikes. 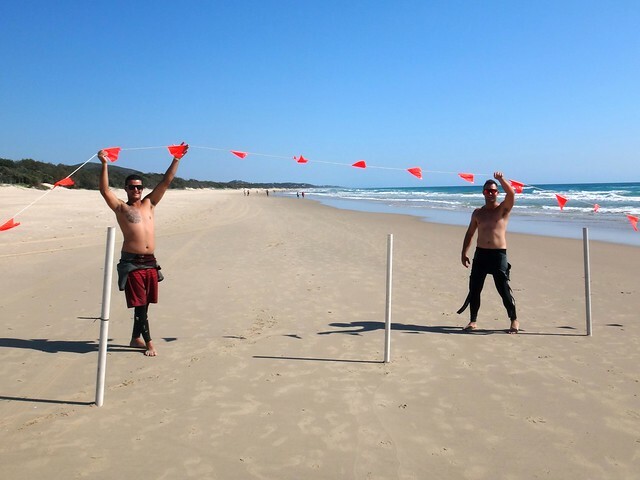 We started on the Northern Banks of the Maroochy River at low tide. 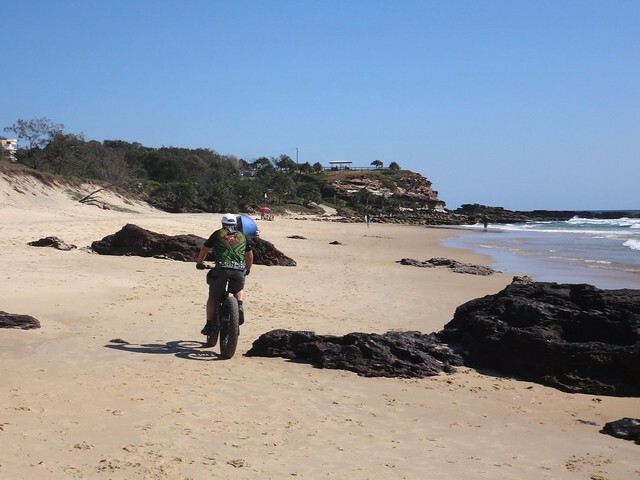 The rocky outcrop of Pincushion Island marked the southernmost starting point of our ride. 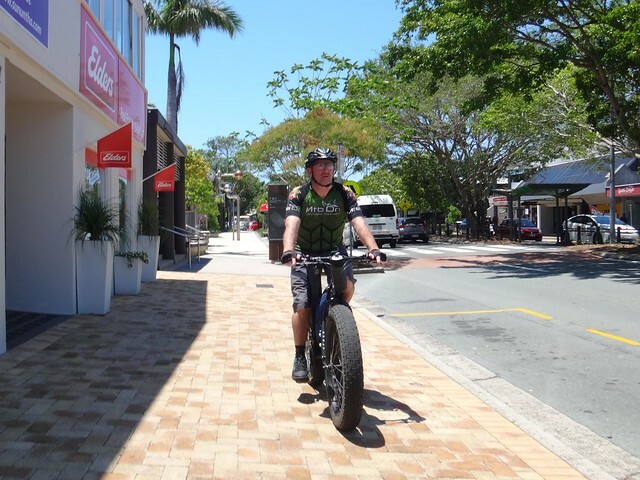 Darb was lucky enough to have the loan of a Fat Bike with huge tyres that would help him float over the sand. 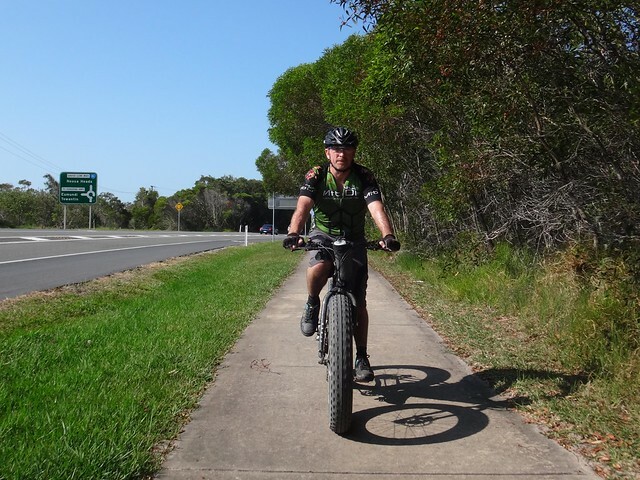 I only had my trusty Anthem, whose tyres looked very skinny compared with Darb’s. In 1823, three ticket of leave convicts: Finnegan, Parsons and Pamphlett, were caught at sea off the coast of Wollongong (south of Sydney) in a storm. They were blown off course hundreds of kilometres, eventually coming ashore at Moreton Island off the coast of Brisbane. They survived mainly because of the kindness of local Aborigines who fed and sheltered them. Making their way to the mainland near present-day Cleveland, these unintentional explorers started walking northwards, in the hope they would eventually reach Sydney. 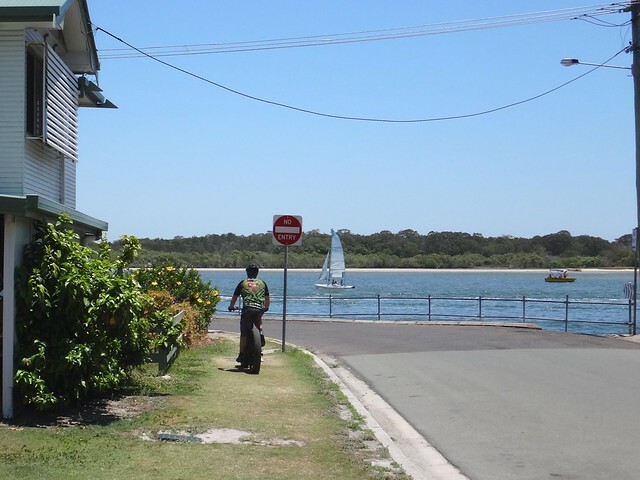 They walked along the coastline as far as present day Kawana before Pamphlett decided to head back south and live with the Joondoobarrie people of Bribie Island. 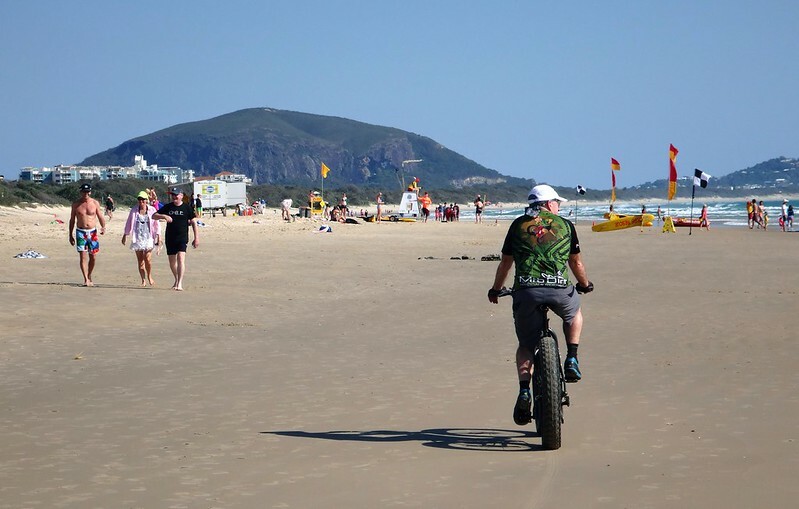 Mount Coolum loomed over the horizon as we rode northwards. Darb’s progress over the sand was effortless. 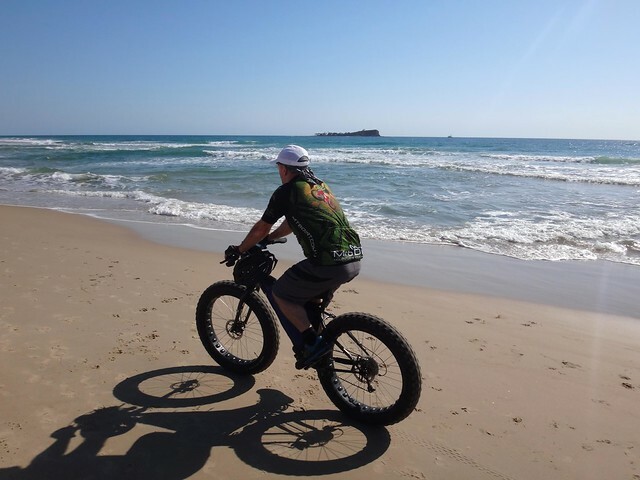 I had to work a lot harder as my skinny tyres bit the into sand rather floating over them. The day was hot. At 8am it was already 32C according to the gauge on my GPS. The beaches were busy with happy people enjoying the breeze, the cool water and the clear blue skies. After about an hour we reached Point Arkwright. This rocky promontory pokes out into the sea and forced us to go inland for a couple of kilometres to get around it. The view from the lookout is impressive. 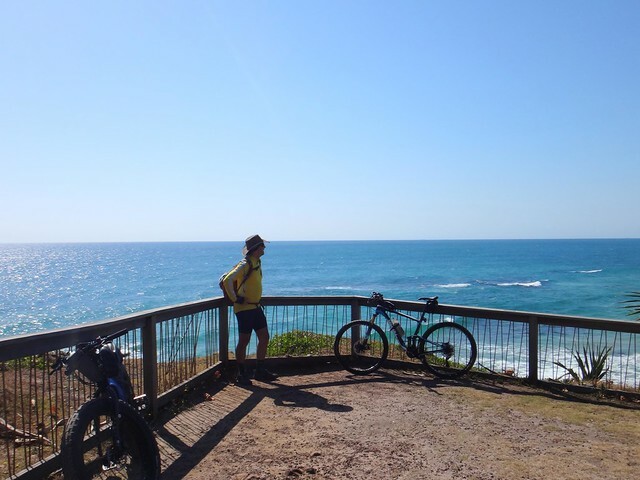 Looking south I could just make out Mudjimba Island on the horizon near where we had started the ride. We had come a long way. Poor old Finnegan and Parsons would have found it hot work trudging through the sand along this beach. 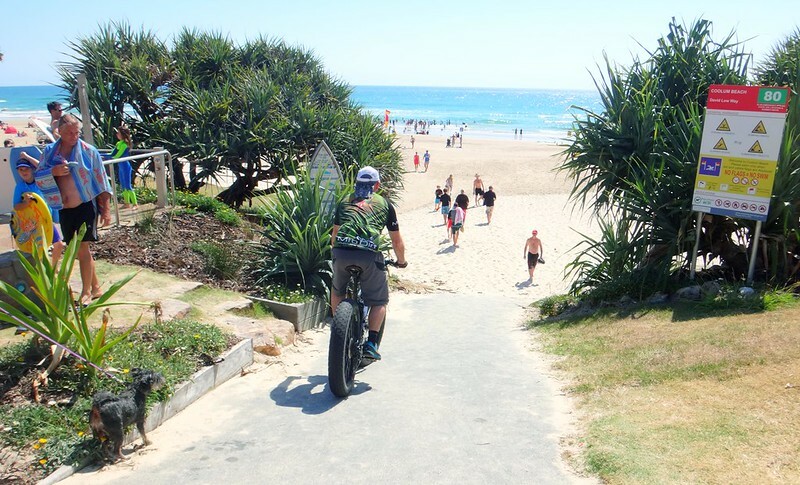 Around the corner, Coolum Beach came into view. We left the bike path and rolled back down onto the beach. Darb’s bike turned heads wherever we went. 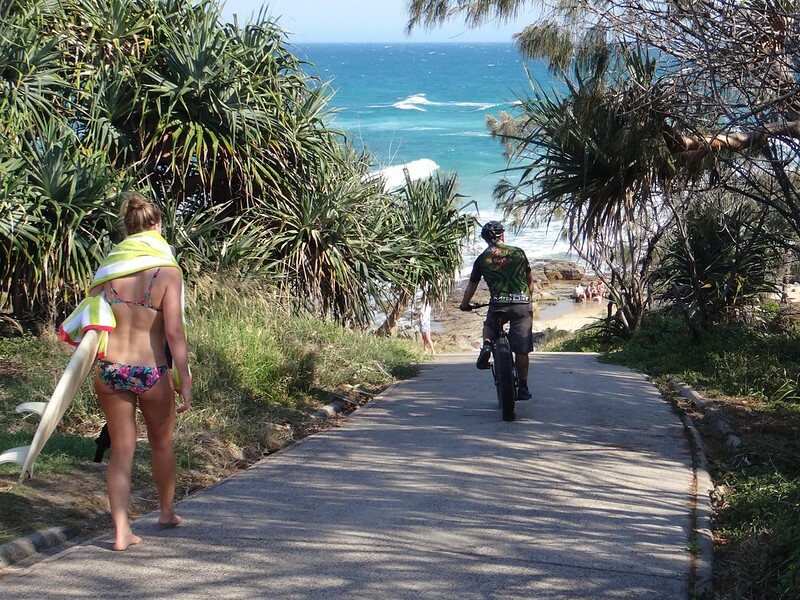 The beaches were packed with “refugees” who had left Brisbane ahead of the G20 summit (and associated tight security) which had descended upon their city that weekend. 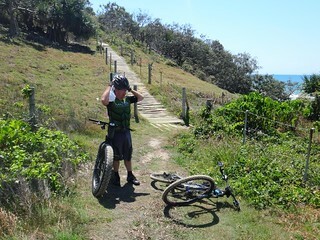 What started as a slight bump on the northern horizon slowly grew into the Noosa Headland ahead of us. 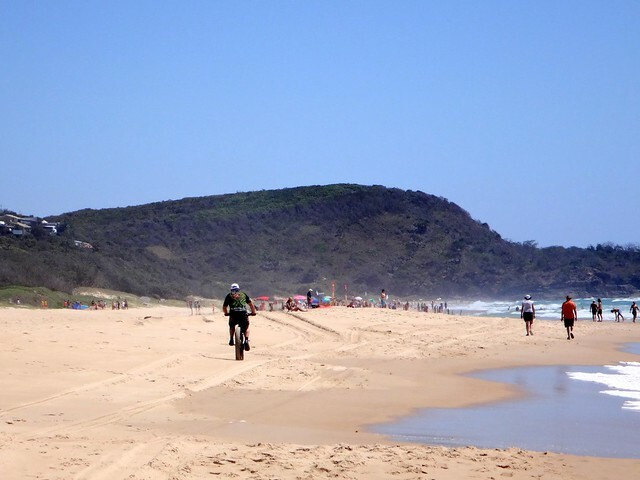 “Castaways Beach” is named after Finnegan and Pamphlett – the first Europeans to visit this beautiful area, the home of the Gubbi Gubbi Aboriginal people. Darb was still turning heads as he rolled effortlessly along the beach, with me grunting and puffing in his wake. 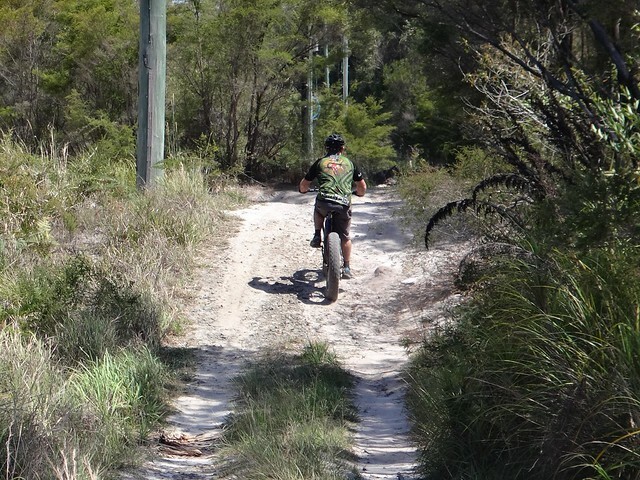 Leaving the trail of the convicts behind us, we made our way up the hill, and replaced beach hats with helmets for the next section of our journey. 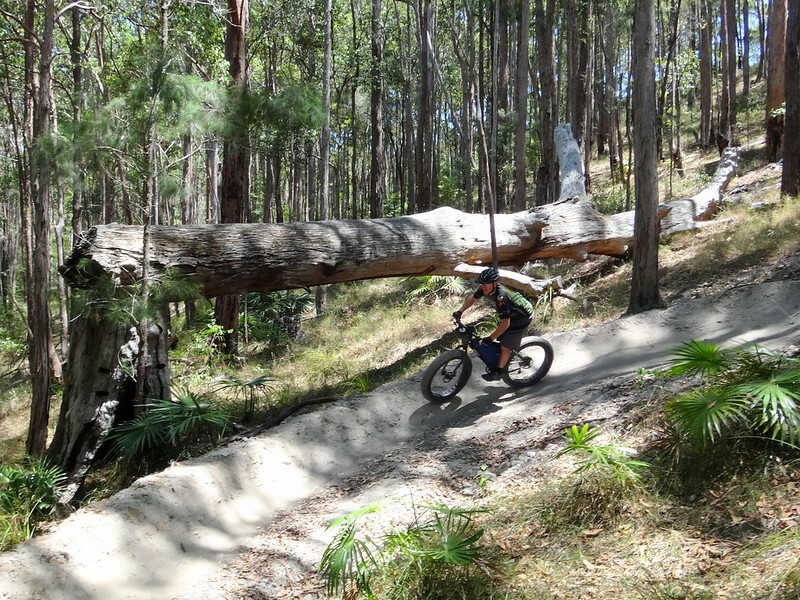 The shade of the forest provided welcome relief from the blazing sun. At 10am the temperature had already hit 35C. … but the roll down the other side was worth it. 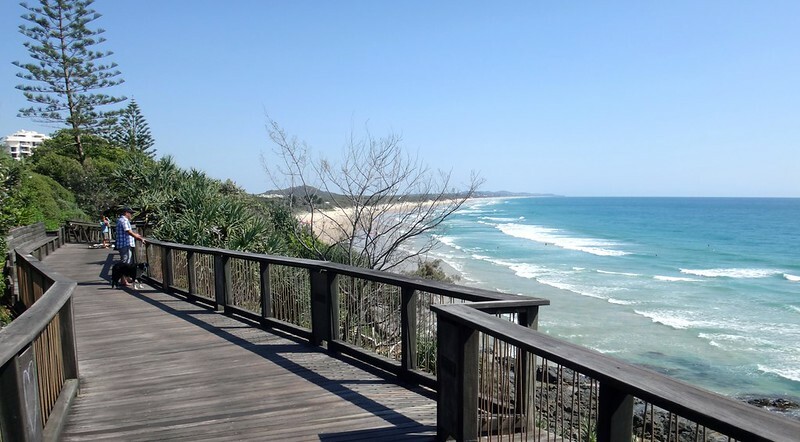 We stopped at Noosa Heads for a quick bite to eat. Instead of filling my pack with water, I bought a bag of Party Ice, and filled it with that. The icy water was delicious. I also had an irrational craving for Salt and Vinegar chips, and hungrily scoffed them down as we cooled off. 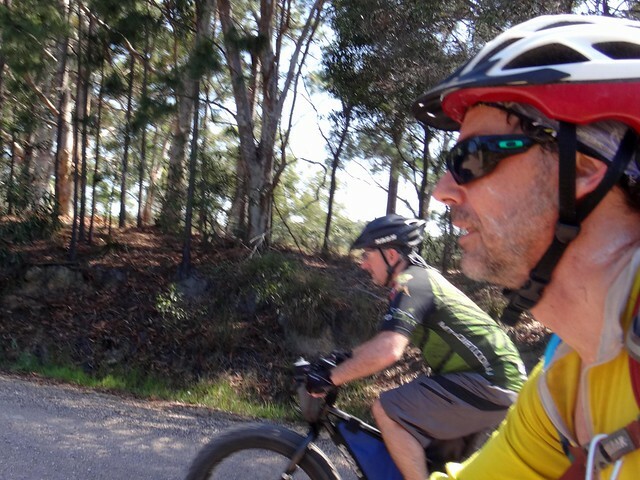 On big rides I’ve learned to listen to the cravings of my body – it’s usually quite accurate about what I should be putting in my mouth. I’m guessing that I needed the salt from the chips after the dehydrating work on the beach. 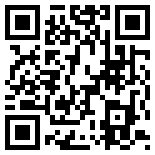 … past marinas full of expensive boats. 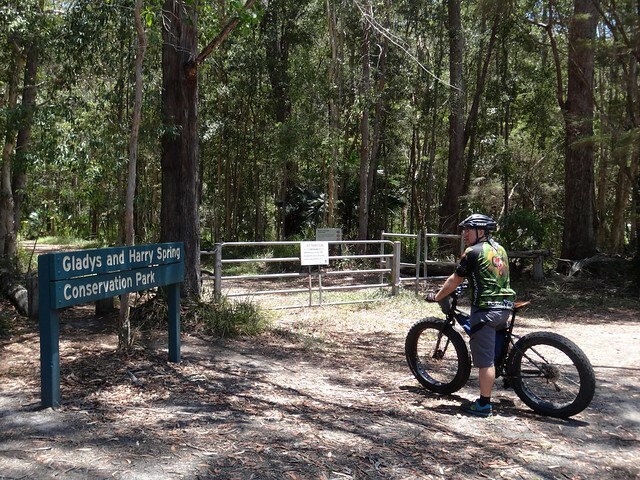 My GPS told me the temperature was 43C as we finally reached Tewantin State Forest. 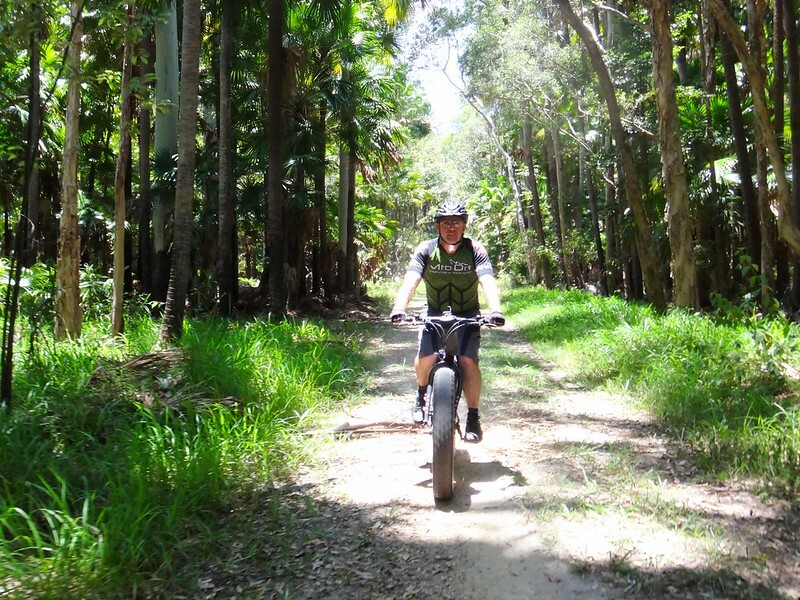 We relaxed in the shade of Cabbage Tree Palms before slowly grinding our way up the side of Mount Tinbeerwah towards the single-tracks of Wooroi. 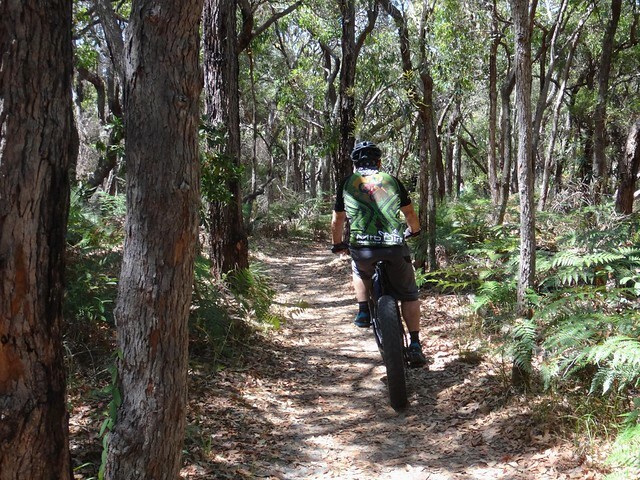 “Bloodwood” is one of my favourite tracks which snakes down the side of the hill through open forest beside a couple of large fallen Bloodwood Trees. 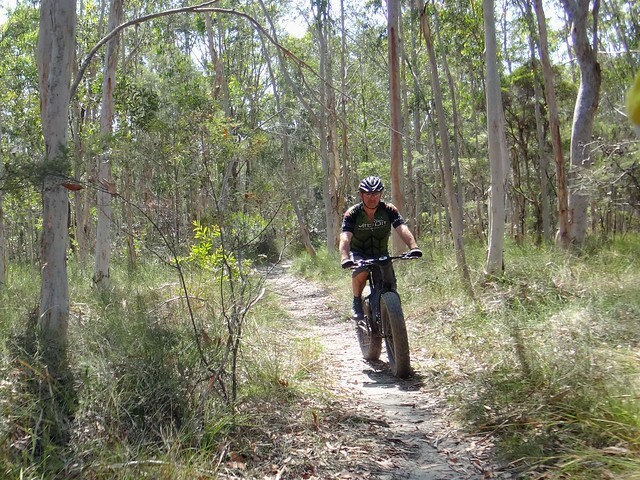 Recent dry weather has made some of the trails very powdery, but Darb relished his grippy fat tyres. I couldn’t keep up with him. 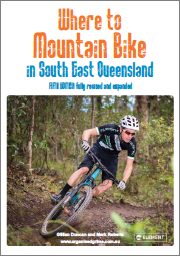 “So do you think your next bike will be a fatty?” I queried. He smiled coyly before eventually admitting “Yeah, probably”. 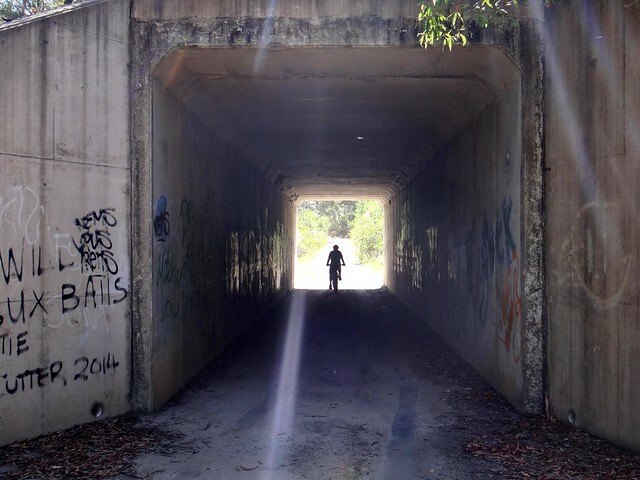 We left Wooroi and followed Old Hollett Road back towards Coolum, passing through this pleasantly cool tunnel under the Sunshine Motorway. I was starting to feel the heat. Having refilled wtih water twice I was getting close to consuming about ten litres of water. 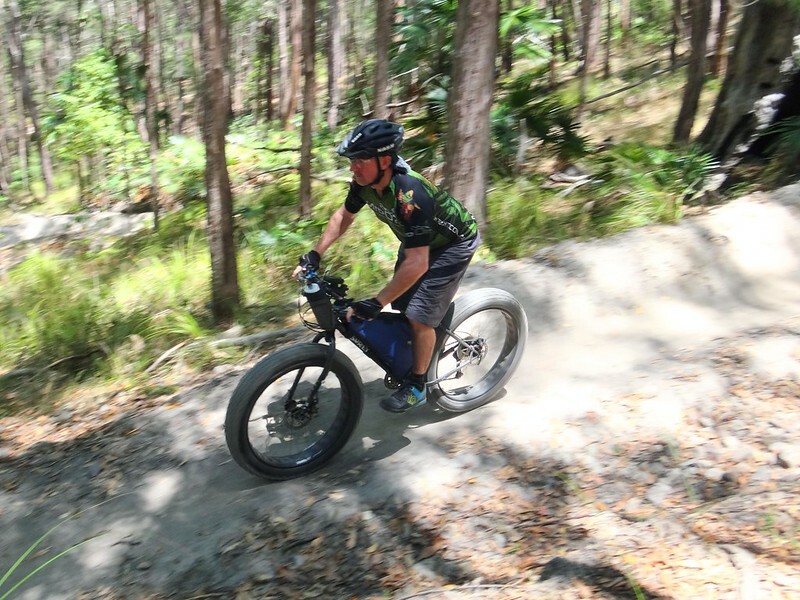 I didn’t really feel like battling more rough trails behind Mount Coolum, so we agreed to take the easier route back to Peregian via Lake Weyba. “Not long and we can get a nice cold drink”, Darb encouraged me. As we neared the Lake Weyba section of the national park, a mob of Kangaroos bounced across the street. 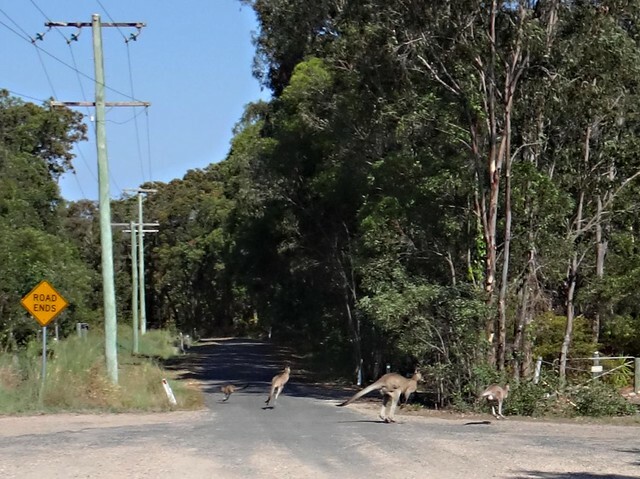 When overseas, Aussies often get asked if we have kangaroos bouncing down our streets. 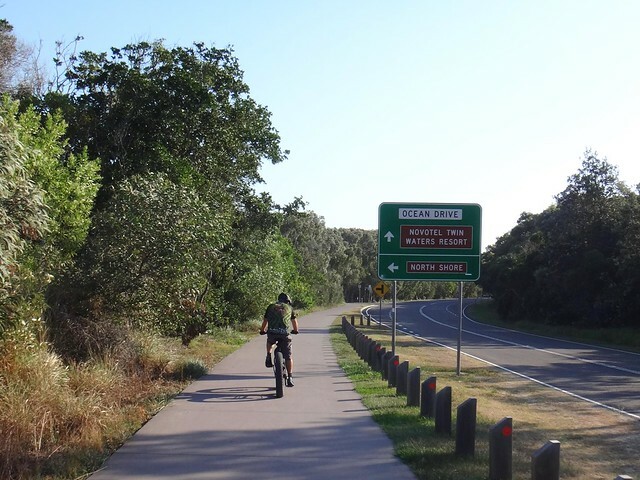 After a welcome rest at Peregian we took the pedestrian option and followed the bike paths southwards. By the time we reached Point Arkwright, it was one hour after high-tide. I suggested to Darb we might want to give the beach another try. 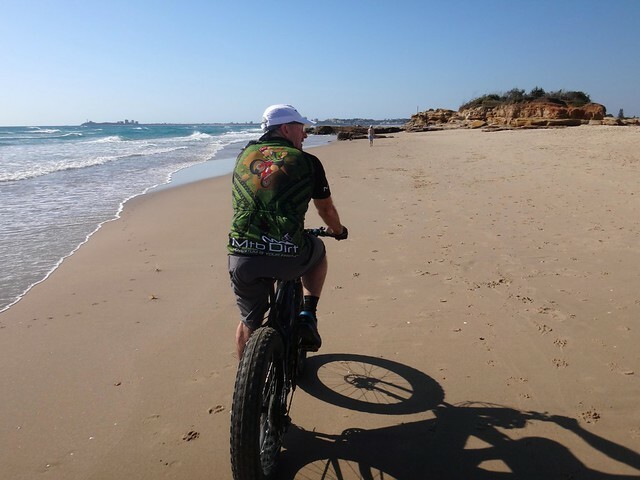 As Darb floated off blissfully over the sand, my narrow wheels sank. 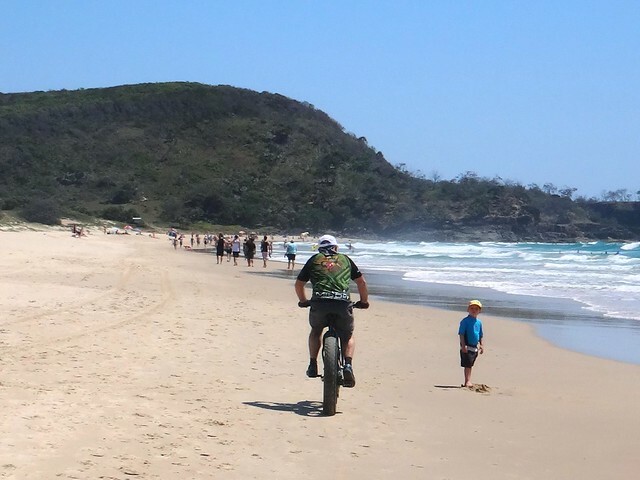 I slowly ground the pedals through the soft surface for about a kilometre, attracting bemused and pitiful glances from beachgoers. 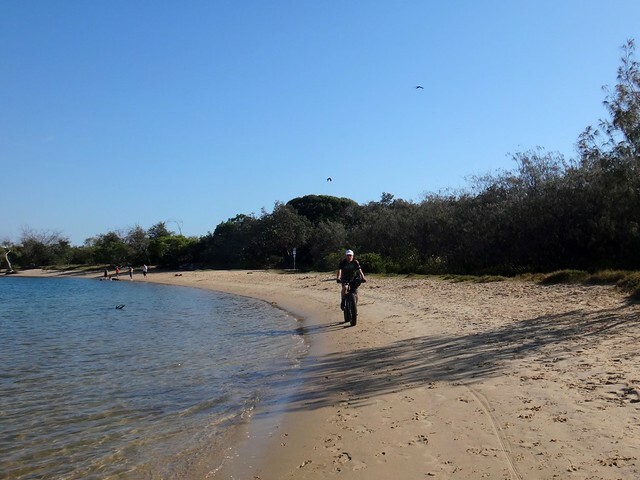 Eventually Darb took pity on me as well, suggesting we jump back over the dunes and follow the bike path back to our starting point. 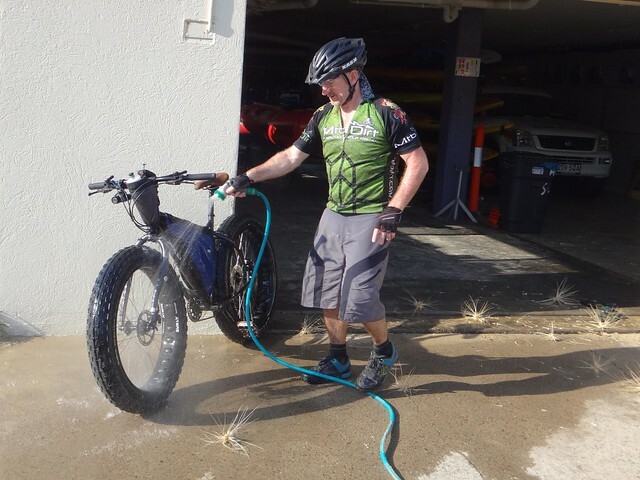 The guys at Marcoola Surf Lifesaving Club kindly let us borrow their hose to wash the bikes down. I could hear my hard-working Anthem Duallie heave a sigh of relief as I hosed off the sand and salt. 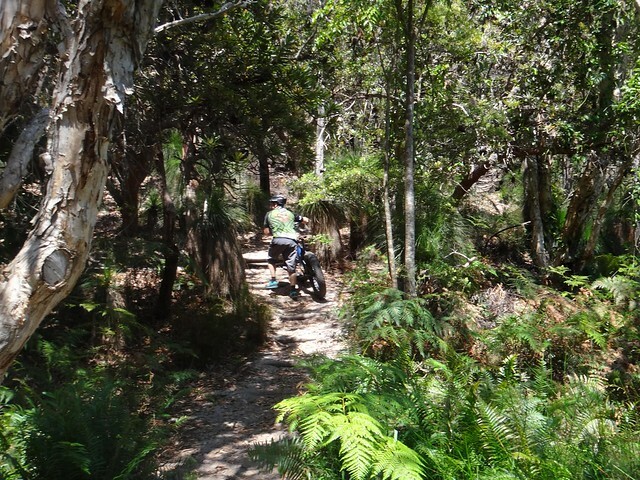 Thanks Darb for a fun (but tough) day out on the bike. 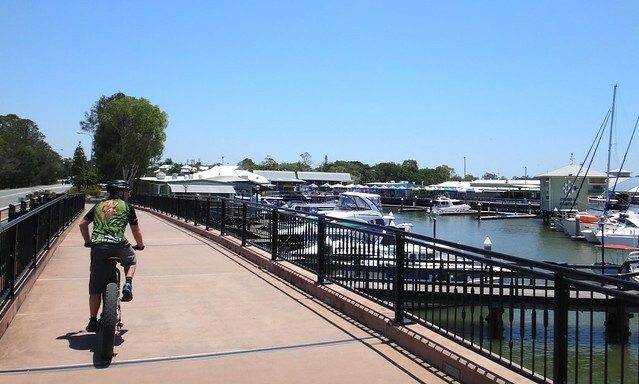 Afterthought: Richard Parsons, our unlucky convict, kept walking along the coast until he reached the Burnett River near present day Bundaberg. 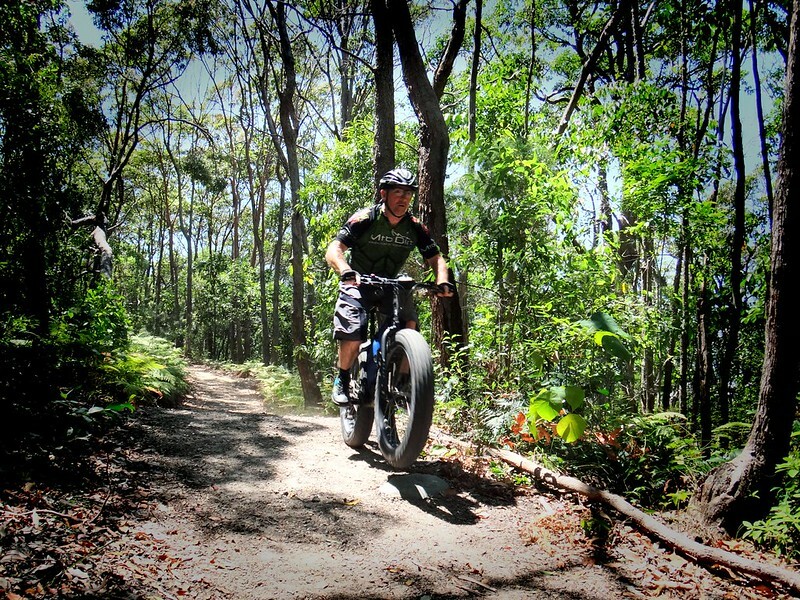 How far would he have gone if he’d had a fat bike? 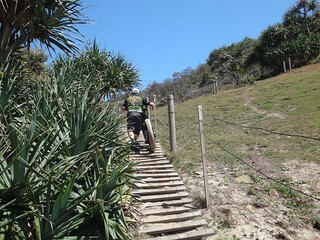 Mudjimba Tewantin 2014-11-15 from Darb Ryan on Vimeo. I had a sports drink on the bike. It’s thick and gooey and had some electrolyte tablets in it. It usually lasts me 4 or 5 hours. I also had some gels and an energy bar as well as the chips and a can of coke. I normally hate coke, but on a hot ride it’s probably the best tasting bad drink you can get. The ice in the backpack was awesome though.